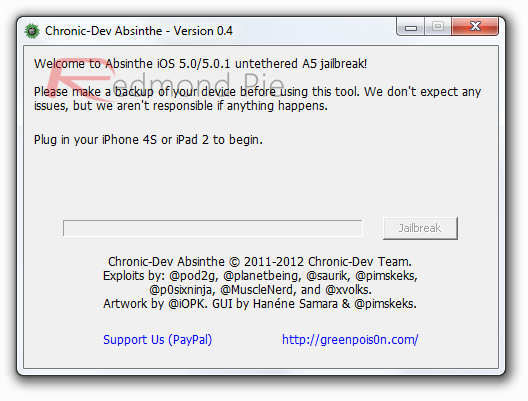 A Chronic Dev-Team member has just tweeted the news that Absinthe, the tool used for the jailbreak of A5 devices (iPad 2 and iPhone 4S) on iOS 5.0.1, has just been updated to version 0.4. Hitherto, we’ve been mightily impressed with this particular jailbreak, perhaps more so than those released previously. Not just because it managed to crack every device currently running Apple’s iOS 5.0.1, but it has been well-maintained ever since, with constant updates and maintenance releases ensuring the smoothest possible jailbreaking experience moving forward. We can’t quite recall seeing quite as much dedication amongst the devs striving to unlock the full potential of our iPhone, iPad and iPod touch devices. Just before the jailbreak was released, a so-called Dream Team was formed, consisting of some of the cream of the jailbreak scene, and aiding the Chronic Dev-Team to meet the demands of the famously-impatient (and oft ungrateful) public as quickly as possible. Even now, the site’s crash reporter feature means you can notify the team – lead by Chronic Dev’s p0sixninja – enabling issues to be resolved in an efficient manner. Although jailbreaking in any way, shape or form is viewed in a negative light by those gracing Cupertino, Tim Cook’s software developers could certainly take a leaf from the Chronic Dev-Team’s book when it comes to swiftly releasing updates to fix problems. Please note, there’s no need to re-jailbreak, so this release only applies to those who have yet to jailbreak their devices. At the bottom of this post are direct links, straight from the greenpois0n website. For jailbreaking iPhone 4S and iPad 2, you can simply follow our step by step guide posted here to jailbreak iOS 5.0.1 using Absinthe on Windows or Mac. For those of you with iPhone 4, 3GS, iPad 1, and iPod touches can use Redsn0w or Sn0wbreeze to untether jailbreak on iOS 5.0.1. Use the relevant tools from the links given tailored for your operating system below before going ahead with the jailbreak.